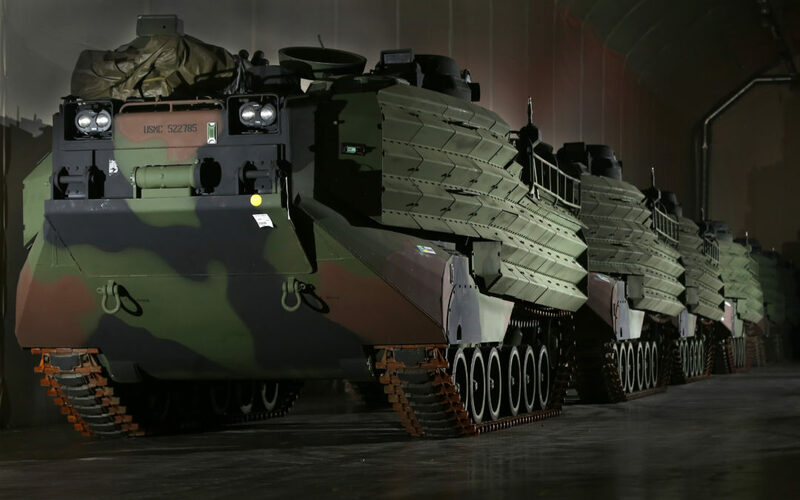 Marine Corps Amphibious Assault Vehicles are staged inside one of the six Marine Corps Prepositioning Program-Norway caves where they will remain until needed for a military operation, humanitarian assistance, disaster relief or training exercise. The equipment was transported by the Maritime Prepositioning ship the USNS Williams earlier in the month for scheduled equipment modernization. Outdated and unserviceable gear will be sent back on the ship to Blount Island Command in Jacksonville, Fla., as the final step in the operation. U.S. Marines from 2nd Marine Logistics Group out of Camp Lejeune, N.C., in coordination with their Norwegian counterparts, are modernizing some of the equipment by placing approximately 350 containers of gear and nearly 400 pieces of heavy rolling stock into the storage caves. Specific equipment, which will greatly increase the program’s readiness, includes M1A1 Main Battle Tanks, Tank Retrievers, Armored Breaching Vehicles, Amphibious Assault Vehicles, Expanded Capacity Vehicle (ECV) Gun Trucks and several variants of the MTVR 7-1/2 ton trucks. Planning for this equipment refresh began in the spring of 2010. Marines and contractors from Blount Island Command in Jacksonville, Fla., and Marine Corps Forces Europe and Africa are also in Norway to ensure the operation is conducted in a safe and timely manner. Grand Traverse Economic Development, a subsidiary of the Grand Traverse Band of Ottawa and Chippewa Indians, has purchased a steel and aluminum manufacturing company with a long track record of supplying equipment for the U.S. Military. The Charlevoix, Michigan-based Bay Shore Steel Works will retain its name. For more than 40 years, Bay Shore has provided fabrication, machining and finishing services to the aerospace, automotive, alternative energy and heavy equipment industries. Tribal ownership will open opportunity to actively engage in the SBA’s Tribal Section 8 (a) disadvantaged set-aside business development program—including the Department of Defense and their 5 percent Indian Incentive Procurement Rebate Program, the federal HUBZone program, the state’s Disadvantaged Business Enterprise and the Minority Business Enterprise programs. With federal defense expenditures increasing, the Tribe and Bay Shore stand to greatly benefit. “The U.S. Military defense budget is the largest it’s been in years. We have many, many Native American people that go into the military and we are providing protection for those military men and women, so it’s an honor for us.” Grand Traverse Economic Development (GTED) Board Chairman Angie Shinos, said. 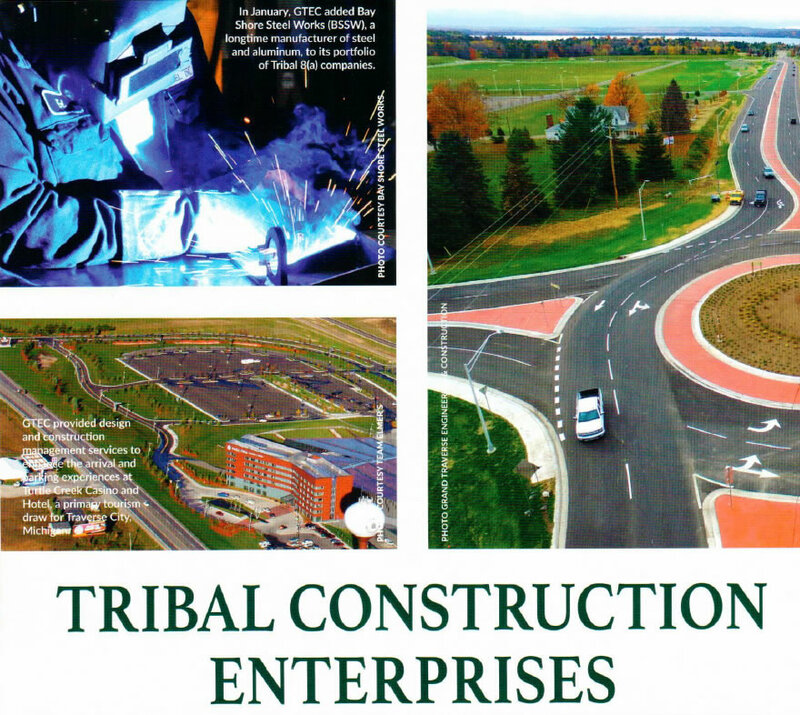 The Tribe’s economic investment arm, GTED, oversees various firms dedicated to federal and state contracting. GTED already owns Grand Traverse Engineering & Construction (GTEC), which is presently forming an information technology (IT) firm, a development company and a land holding company. “In Indian country, we do look at federal government contracting as an alternative revenue opportunity for Tribes,” said Thomas E. Wilbur, GTED chief executive officer. Through the transition and after, GTED will retain Bay Shore’s existing management and its roughly 40 employees, Wilbur said.